“Expand. Evolve. Grow. Forget not the goal. Let’s see….in a “modern” yoga class Swamiji would be told his yoga is “wrong”…..
Oh my! His legs aren’t straight in locust! He has a rounded back in his forward fold! Look at his hand position in shoulderstand! He must not know what he’s doing! Shame on his yoga teacher for allowing him to do that! His fingers MUST point up, not turned out to the side, that’s not right! He is seriously going to injure himself! 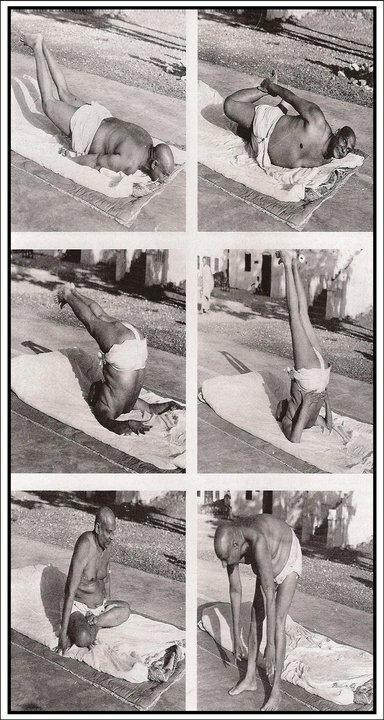 In a “modern” yoga class Sivanandaji would also be told to put his elbows closer together in his shoulderstand and a teacher would immediately run up to put a strap around his upper arms because that’s the way his arms “should” be. And Swami, look at your belly! You need a lot more CORE WORK! C’mon, Swami…get a Yoga for Abs DVD! in India it is said that a belly like that comes from a strong pranayama practice…lots of sadhus at the Kumbh Mela had big bellies! I've never commented here before but this one was too perfect to pass by. I went back to my local studio today after five (five!) weeks of no-showing, and all because I had two instructors who said/did all those things you've mentioned, right down to the straps around the arms in shoulder stand. And I let it scare me away from my yoga practice, like a big wimpy dork. I went to a different instructor today and all was well, and I'm really, really, really glad I went back. OK, just sharing. I love your blog like crazy. Holy Shiva, Liz, please stop by again!! your last sentence made my day! I love this! My grandmother was my first yoga teacher. She taught classes in the late 60's to the 80's. Before she died, she gave me lots of her old books. Every picture in them is “wrong” by modern standards. Between those books and the elderly that I work with, I have /completely/ abandoned the idea of a universal form for each asana. And my students are LOVING it! love your comment! thank you for reading! I once had this totally lame yoga teacher tell me that because my elbows weren't far enough back in shoulder stand, that perhaps I should just not do it at all. Can you believe it?! I rolled my eyes and ignored her. But I get what you mean. And I'm finding in the classes I've taught so far that unless someone is doing something that could possibly causes themselves an injury, I usually don't correct too much. I love Sivananda BTW. I have some kind of weird connection thing going on with him. exactly, svasti…I don't do a lot of adjusting unless it seems like someone is seriously going to injure themselves. in the 8 years I've known my teacher who I certified with, I can count on one hand how many times he has “adjusted” me. The Chinese writing system has two characters for what we might call “form”. The first also means “mold”. That is to say, the form is determined by forces coming from outside it. The second also means “shape”. I take this to mean the form is determined by forces within. I imagine in yoga, as in the martial arts, you must start with the former. But too many people wind up stuck there and cannot understand that the latter is what we are truly aiming for. BTW, Linda, I love your Holy Shiva's! Hey Mary Elizabeth, what are those books? I remember my mother doing yoga in the early sixties and she had a couple of books but can't figure out what they were. Maybe you can scan the cover and some photos from inside. Think we would all find them fascinating. Those ridiculous ideas of perfection in asana. Down with the Yoga Police! Classic post. Love it! I don't wanna be “right”! Love love love this post! So so true. I really REALLY miss my yoga teachers in England who had us chanting (in regular weekly evening classes) as well as pranayam, meditating and references to philosophy … this side of the pond it's all asine asana references! I exaggerate a little but I wish there was less emphasis on alignment and more on philosophy/other practices.